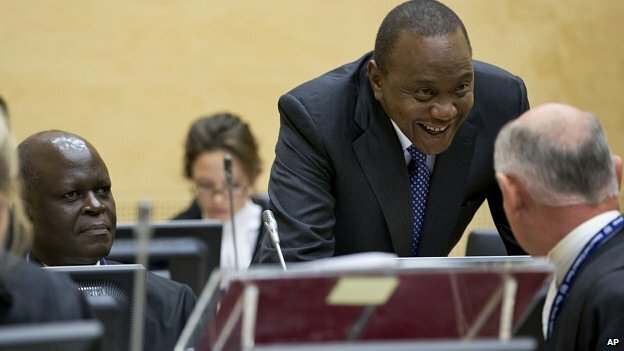 Kenyatta appears at ICC in Hague for landmark hearing? Kenyan President Uhuru Kenyatta is appearing before the International Criminal Court (ICC) where he faces charges of crimes against humanity. He is the first serving head of state to come before the court in The Hague. He was summoned to appear at the ICC “status conference” after the prosecution said it did not have enough evidence to go ahead with a trial. The charges – which Mr Kenyatta denies – concern his alleged role in violence following the 2007 elections. More than 1,000 people died in the aftermath of the poll. Mr Kenyatta says the charges against him are politically motivated and insists that the case should be thrown out. The prosecution accuses the Kenyan government of obstructing the investigation. The BBC’s Anna Holligan in The Hague says there were chaotic scenes as Mr Kenyatta arrived at the ICC, where a large crowd was waiting. 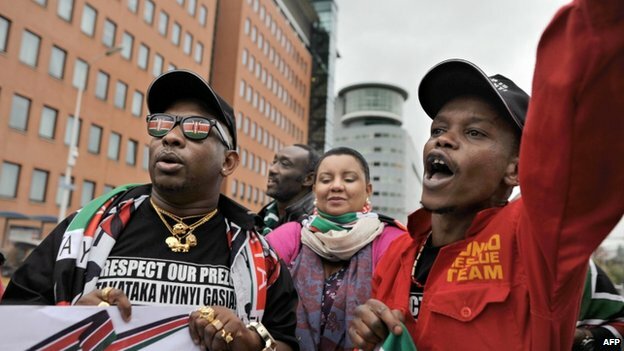 The ICC wants him to explain allegations that evidence against him had been withheld by the Kenyan government – a claim rejected by Kenyan Attorney-General Githu Muigai, who appeared before the court on Tuesday. Uhuru Kenyatta cuts a composed figure in court. He sits back, occasionally glancing at his “first family”‘ on the front row of the public gallery. He is wearing a patriotic bracelet in the Kenyan colours. Never has there been a more glamorous audience in attendance. Pink and yellow headscarves and gold earrings punctuate the mostly grey suited public space, bringing some colour to the dark period of Kenyan history that is the subject of this hearing. The president temporarily relinquished power to come to The Hague. 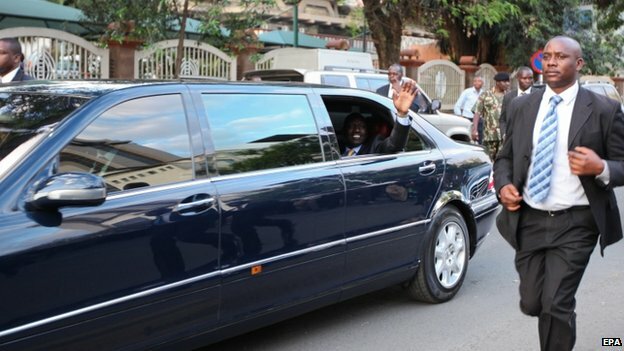 Nevertheless, his convoy received a presidential welcome. Flag-waving crowds surged as his police-escorted car pulled up. International TV crews jostled to get him in their frame. This trial is testing the limits of international justice. The prosecution says Kenya is not co-operating by handing over evidence. Kenya says that if they do not have the evidence, the charges must be thrown out. 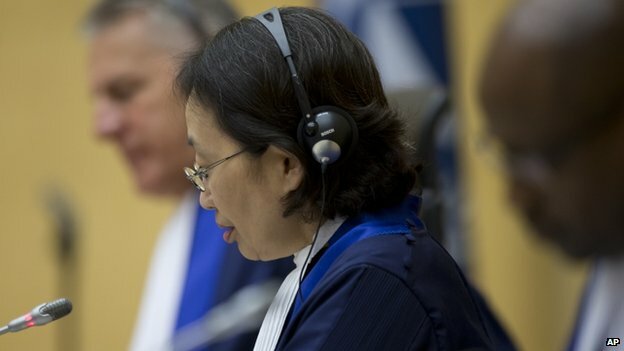 The ICC was partly designed to demonstrate that even the most powerful leaders cannot be above the law. Regardless of whether Uhuru Kenyatta is guilty or innocent, one thing he has proved is that it is extremely challenging to prosecute a president. Defence lawyer Steven Kay said Mr Kenyatta would not be making a statement. He said the government had co-operated with the prosecution requests where it was possible to do so. ICC chief prosecutor Fatou Bensouda, who is from The Gambia, said there was still a significant “body of evidence” against Mr Kenyatta. The prosecution, which wants an indefinite adjournment, told the court it had phone data and nine witnesses who were willing to testify how Mr Kenyatta had funding links with the Mungiki sect which took part in the violence. Fergal Gaynor, a lawyer for the victims, said they were entitled to know why witnesses for the prosecution had withdrawn from the case. In September, the court postponed the trial after prosecutors said the Kenyan government had failed to deliver key documents. Deputy President William Ruto is acting president while Mr Kenyatta is at The Hague. On Monday, the president again stressed his innocence, saying his conscience was clear. In a speech to the Kenyan parliament, Mr Kenyatta said that he was going to The Hague in a personal capacity – not as president of the country – so as not to compromise the sovereignty of Kenyans. No special arrangements have been made at the ICC. The main spokesperson for the court said that Mr Kenyatta would not be treated differently from any other accused person. What is the ICC and how does it work? Earlier, former ICC chief prosecutor Luis Moreno Ocampo conceded that the trial “was not working well” but welcomed Mr Kenyatta’s appearance as “showing African commitment to change”. Mr Kenyatta was elected in 2013, despite facing charges. Analysts said he turned the prosecution to his advantage, portraying it as foreign intervention in Kenya’s domestic affairs. Mr Kenyatta has accused the court of being biased against African leaders. In 2009 the ICC also issued a warrant for Sudanese President Omar al-Bashir over alleged war crimes in Darfur, but he has not yet been arrested. Mr Kenyatta faces five charges relating to the ethnic massacres – the worst violence in Kenya since independence in 1963. Tens of thousands of people were displaced and Kenya’s reputation for stability was tarnished. Mr Kenyatta was a close ally of President Mwai Kibaki, who was declared the winner of the 2007 election. Mr Kibaki’s rival, Raila Odinga, claimed the poll was marred by fraud. 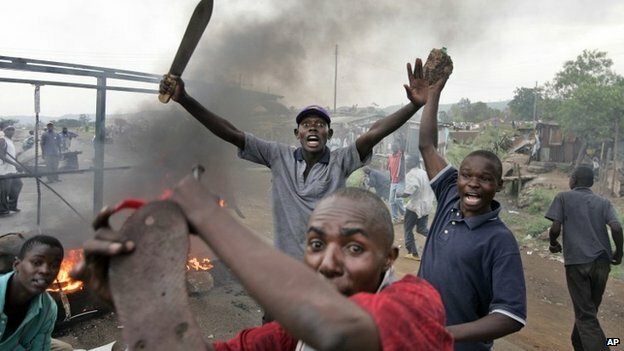 The dispute took on an ethnic dimension, pitting members of the Kikuyu ethnic group of Mr Kenyatta and Mr Kibaki against other communities. Mr Kenyatta is accused of organising an ethnic Kikuyu gang, the Mungiki sect, to attack rival groups. Vice-President Ruto also faces charges at The Hague, but he was on Mr Odinga’s side during the violence. He also denies the charges. Posted on 8th October 2014 by newsafrica. This entry was posted in Africa, Human Rights Violations, ICC, Kenya. Bookmark the permalink.